I’ve been trying for years to find a good apple pie or crisp recipe, because it’s something Jeremy frequently requests. There have been times when I’ve come close, but either the topping wasn’t crisp enough or thick enough, or the apples were bland and mushy or so wet that the crust turned to goo overnight. But I think, as of yesterday, my search is over. For filling: Peel, core, and slice each apple into 16 wedges. Mix dry ingredients in large bowl, and toss to coat apples. Add vanilla and melted butter and toss thoroughly. For topping: Blend first 6 ingredients in processor. Add chilled butter cubes; pulse until mixture resembles wet sand. Toss filling to redistribute juices; transfer to crust, mounding in center. Pack topping over and around apples. Don’t panic if it seems huge; the apples will cook down. Bake pie on baking sheet until topping is golden, about 40 minutes (cover with foil if browning too quickly). Reduce oven temperature to 350°F. 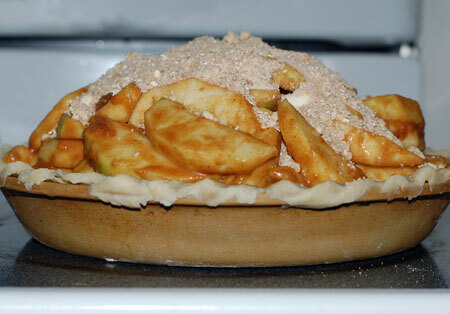 Bake until apples in center are tender when pierced and filling is bubbling thickly at edges, about 45 minutes longer. Cool until warm, about 1 hour. Serve with vanilla or cinnamon ice cream. 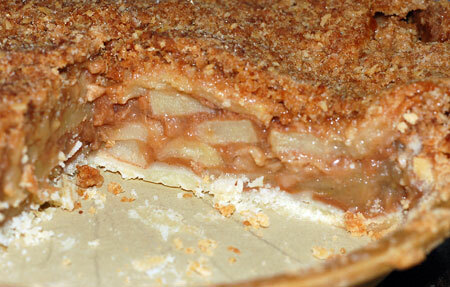 Source: Adapted from Cinnamon Crumble Apple Pie at Epicurious. The pie crust recipe I used this time was a little difficult to roll out because it tended to crumble, but the result was an incredibly flaky crust. 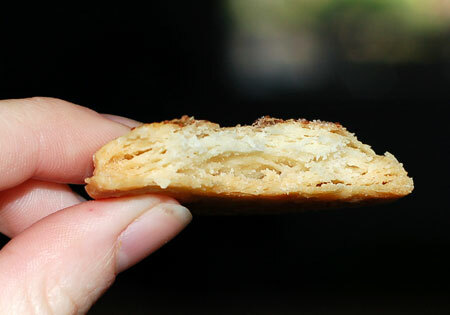 The photo above is a cross-section of a pie crust cookie made with rounds of dough scraps and various sugars (cacao nib, coconut, cinnamon, and demerara). You can see just how flaky even the rerolled scraps came out. Mix flour, salt, and sugar in a food processor fitted with a steel blade. Scatter butter pieces over flour mixture, a few at a time. Cut butter into the flour mixture with short pulses. Add shortening a tablespoonful at a time, and cut into mixture with several more short pulses, just until the mixture resembles coarse cornmeal with butter bits no bigger than peas. Pour mixture into a mixing bowl. Mix ice water and vinegar in small measuring cup to blend. Drizzle over flour mixture; stir with fork until moist clumps form, adding more water by teaspoonfuls if dough is dry. Do not overwork dough. Gather dough into two balls; flatten into disks and wrap in plastic; refrigerate at least 30 minutes. Ready to roll! Enough for one double-crust 9-inch or 10-inch pie. Source: Slightly adapted from the Combination Butter and Shortening Crust (scroll down) at Simply Recipes. 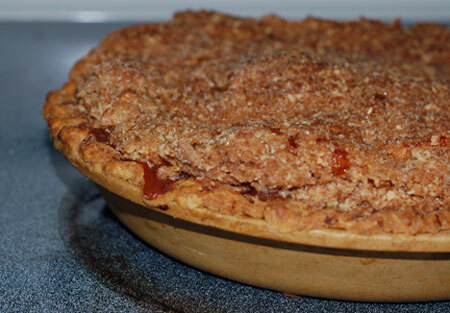 Apple pie with a crumb topping is my favorite. No matter how many double crust apple pies I try, i always come back to the crumb topping. I have to admit, I’ve never gotten around to making a double-crust version, because I can never pass up the deliciousness that is streusel.